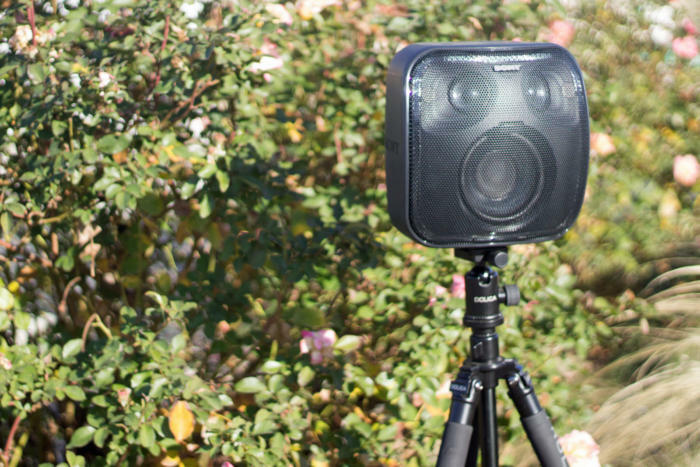 You might find this heavily weatherized wireless speaker's light show more compelling than its audio performance. If the barrel-shaped JBL Xtreme 2 that Scott Wilkinson reviewed a couple weeks back is ready to party, Sony’s cubist SRS-XB501G smart speaker is equipped to deliver a crowd-pleasing LED light show at a backyard rave. A young crowd, that is. Color-shifting LED light bars run around the perimeter of the speaker’s face, and there’s a pair of independent white LEDs in the top middle. A second white LED sits above the woofer. Sony says these lights can be synchronized to the music you’re listening to, and there are no fewer than six light modes for you to choose from (rave, chill, hot, cool, strobe, and random flash). But Sony has a loose definition of synchronization, because the pattern of the XB501G’s pulsing, flashing light bars seemed random to me. The aforementioned settings have some effect—“hot” draws from a palette of red, orange, and yellow, for example, while “cool” cycles through shades of blue and green—but the changes in those and the other illumination settings bear little correlation to the sounds coming out of the speaker. 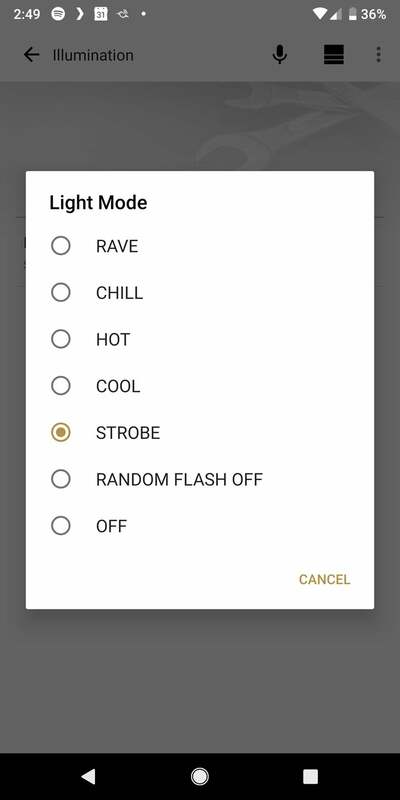 What’s more, the light show carries on even when no music is playing (you can turn it off in Sony’s app or by pushing a button on the speaker itself). Sony’s outdoor speaker looks like a small PA system when perched on top of a tripod. The XB in the model name stands for “extra bass,” but I wasn’t particularly impressed with this $300, 2.1-channel boom box’s low-frequency performance—especially when I moved more than a couple of feet from the speaker’s metal grill. High frequencies from the dual 1.75-inch full-range speakers—angled slightly to the left and right to widen the speaker’s sound stage—lean toward the shrill. Audio performance improved considerably once I enabled the ClearAudio+ DSP algorithm in Sony’s Music Center app. That took the edge off highs, delivered some emphasis to the midrange, and slightly boosted the bass. Pushing the speaker’s “Live” button expanded the sound stage even more, but it also lent an unpleasant echo to the speaker, as if I were listening to music in a cave. The LED light show is polarizing, but haters can leave them dark. I suspect the reason for the muted bass performance is the cabinet’s sealed design. A more typical speaker would have a ported design and would be augmented—as is the JBL Xtreme 2—with a passive radiator. Sony takes a more honest approach: The bass you’re hearing is coming from the large 4.92-inch driver itself. 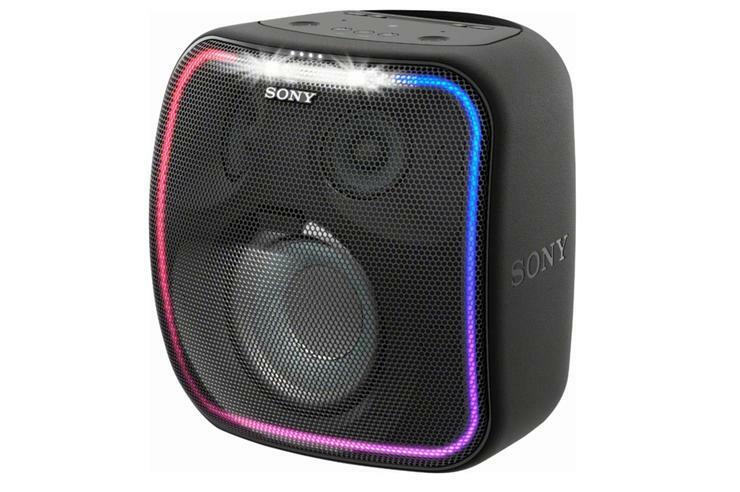 Sony’s speaker produces agreeably tight bass, where a poorly designed passive radiator can sound flatulent. But if you’re the type of listener who craves a feel-it-in-your-bones bottom end, the XB501G will likely disappoint. I found that it helped to listen to music that inherently emphasizes bass. Morcheeba’s “Love is Rare” and “World Looking In,” from the band’s album Fragments of Freedom, for example, came close to scratching that itch. But I like lots of other forms of music, too, including jazz. And the way the XB501G delivered the Gil Evans Orchestra’s performance of “Where Flamingos Fly,” from Out of the Cool, just didn’t do it for me. Most speakers perform best indoors, where they can take advantage of nearby surfaces to reflect and augment sound waves. So I found it to be an interesting turnabout that I preferred how the XB501G sounded in my yard to the way it sounded in my home theater. The speaker has a standard 1/4-inch threaded mount on its bottom, which made it easy to set on the tripod I typically use for my camera. If you’re using the speaker in your backyard—or at the beach—you can elevate it to ear level without needing any furniture. And you needn’t worry about leaving this speaker out in the elements: Sony gives it an ingress rating of IP65, meaning it’s dust tight and protected from water jets from up to a 6.34mm nozzle. It probably won’t survive a dunk in a pool, but you should be able to rinse the sand off it after a beach excursion. Sony makes it easy to take the 6.83-pound XB501G with you, molding an oversized handle into its top and putting a large lithium-ion battery inside. Sony says the speaker can run for 16 hours on battery power if you don’t fire up the lights, but I didn’t attempt to verify that. You can press a button on top of the cabinet to get a spoken report on the battery’s precise status: “Battery about 80 percent,” for example, and “Low battery, please charge” were two of the results I heard during my evaluation. A USB-C port on the back of the speaker lets you charge another mobile device from the speaker’s battery. The app Ampere reported that my Pixel 2 XL was able to draw between 850- and 1,040 milliamps this way, but it didn’t trigger fast charging. The SRS-XB501G is easy to lug around, just don’t forget to unplug its power cable. You can stream music to the XB501G via Bluetooth (the speaker supports NFC for quick pairing), but I suspect most buyers will take advantage of the speaker’s Chromecast compatibility. In addition to the connectivity convenience, this allows you to stream to multiple XB501G’s—and any other Chromecast speakers—simultaneously. It would be much cooler if you could create a left and right stereo pair with two XB501G’s, but Chromecast doesn’t support that (and this speaker doesn’t support True Wireless Stereo, either—although that tech only works over Bluetooth anyway). Chromecast isn’t the only Google technology onboard. This speaker also supports Google Assistant (there’s a dual-band 802.11a/b/g/ln Wi-Fi adapter inside), but the speaker had trouble hearing my “Hey Google” commands when it was cranked to its maximum output. I had to get very close to the speaker and yell before it would recognize me. A smart speaker you can take with you could be handy, although you’ll need to tether it to your smartphone’s personal hot spot to obtain the required Wi-Fi connection. 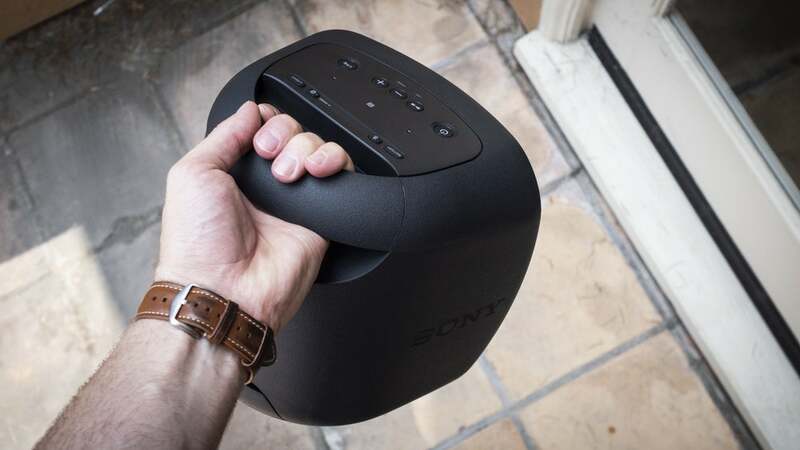 Sony’s SRS-XB501G is a rugged speaker designed for partying outdoors. Its LED light show is sure to draw a crowd, and the 1/4-inch threaded mount on its bottom is just the ticket for elevating it with a tripod. I’m not a big fan of its sonic performance, which lacks low-end frequency response despite its oversized woofer. The LEDs, meanwhile, struck me as a bit silly. But that last criticism could also just be me showing my age—my kids thought the light show was fabulous.